Raju Narisetti is Senior Vice President and Deputy Head of Strategy for News Corp. He is primarily involved in new digital projects and helps guide the digital growth of the existing companies in News Corp as they seek to further expand the distribution of their content across digital products and platforms. Previously, Mr. Narisetti has served as a Deputy Managing Editor of The Wall Street Journal and Managing Editor of The Wall Street Journal Digital Network. In this role, he headed editorial teams and content strategy for The Wall Street Journal Digital Network, which includes WSJ.com, MarketWatch.com, WSJ Live video platforms, and Wall Street Journal and MarketWatch Radio Networks. 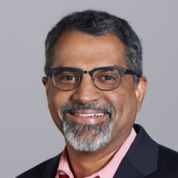 Previously, Mr. Narisetti served as Managing Editor of Washington Post Co. since January 2009, overseeing digital content, news products and new businesses, as well as its editing, design, photo, video, engagement and social media teams. Prior to joining the Post, Mr. Narisetti served as Founding Editor of India’s Mint newspaper, which has an exclusive agreement to publish WSJ-branded content in India and is now India’s second-largest business newspaper by circulation. During his previous tenure with WSJ, starting as a Summer Intern in 1991, Mr. Narisetti held multiple roles, most recently as a Deputy Managing Editor as well as Editor of The Wall Street Journal Europe in 2006, and led the re-launch of the European and Asian editions of the Journal.began his journalism at The Economic Times in New Delhi, India, and later worked as a Staff Writer at The Dayton Daily News, Ohio. Raju Narisetti was named a Young Global Leader by the World Economic Forum in 2007. He is a life member of South Asian Journalists Association and a trustee of the International Institute of Education, which administers the Fulbright fellowships. He is also on the board of ICFJ, the International Center for Journalists.Raju holds a BA degree from Osmania University in Hyderabad and an MBA from the Institute of Rural Management in Anand, a Post Graduate diploma from The Times School of Journalism in New Delhi, and an MA in Journalism from Indiana University. "There can't ever be enough recognition for great teachers across the world. I am delighted to be a part of the Global Teacher Prize effort of the Varkey Foundation."